japonisme: don't believe a thing i say! okay, april fools and all that, but i'm not completely kidding (and since i didn't finish this yesterday, it might not count anyway). sometimes in the mythologies i try to untangle for you i get some things seriously wrong for one main reason: i forget to check the dates. in fact i wouldn't be sur- prised if i haven't attributed some things to some artists that happened long before, or long after, they died. i hope you know what i mean! 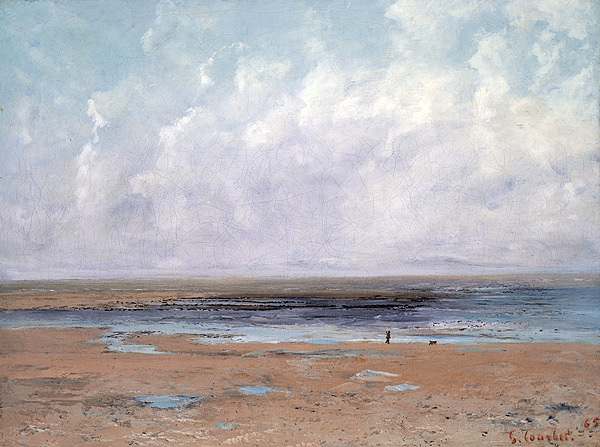 let us begin with, for example, gustave courbet who died at age 58, in 1877. he was born in 1819. obviously. see his example above right? very natural clouds. no outlines. (they really tend to not have any outlines; i have been checking.) and then we have hokusai: all outlines, nothing realistic about them. while he was born in 1760, he was producing artwork until his death in 1849. quite an overlap in lives, these two. the moment of japonisme would have passed hokusai by completely, while all of courbet's training and experience, and the way he saw, were set by the time of the invasion. now to put these generational questions into some context, may i mention that hiroshige lived from 1797 to 1858 (getting closer to courbet, aren't we?) and monet lived from 1840 to 1926. monet, the impressionists, were the first artists to imbibe from the teacup of the japanese, but the next gener- ation made things extremely interesting. 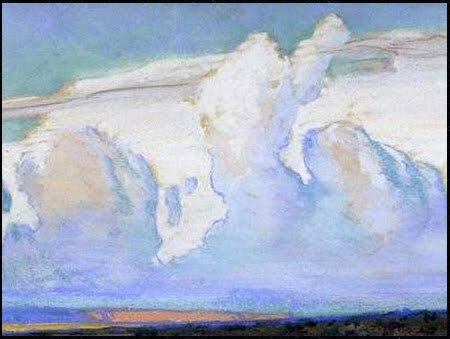 there were the cowboy painters, painers of the mesas of utah and arizona, dixon, cassidy, and borg: realistic clouds with outlines. 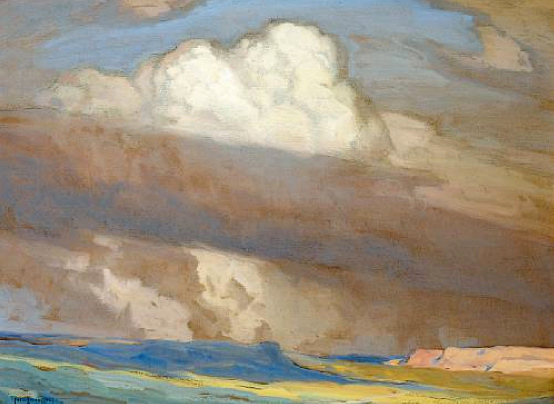 they were the next generation; they, these brilliant western painters, were of the same generation as some of the artists we have gotten to know well over the years: henri riviere, pierre bonnard, frances gearhart, and, only slightly younger, hiroshi yoshida. yoshida did not even begin to make prints (he had been a western-style painter, as they were called then) until he was in his 40s -- one year before arthur wesley dow died! what this boils down to is that any illustration i have given you of influences yoshida may have had on dow are completely erroneous! arthur wesley dow's birth (1857 - 1922) occurred one year before hiroshige died! dow was more a contemporary of monet than the many proponents of japonisme with whom i have linked him; dow was, as was monet, the first wave -- the primogenitor of influences of japonisme, and not any part of the gang. 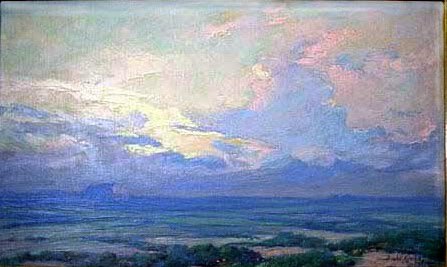 henri riviere, pierre bonnard, carl oscar borg, maynard dixon, and hiroshi yoshida all died within four years of my birth. these donors of legacy are no further in the past than is world war II. these artists are of the generation of my grandparents, or great-grandparents. in other words, we still swim in their stream. there was no flood diverting it. so with regard to clouds (and we have discussed them before; just click on the 'clouds' tag to see the other discussions), we now have a much clearer line of inheritance: it is obvious that the japanese gave us outlines and we gave them perspective. they gave us simplicity and we gave them the multi-pigmented shades of color of which the world is built. 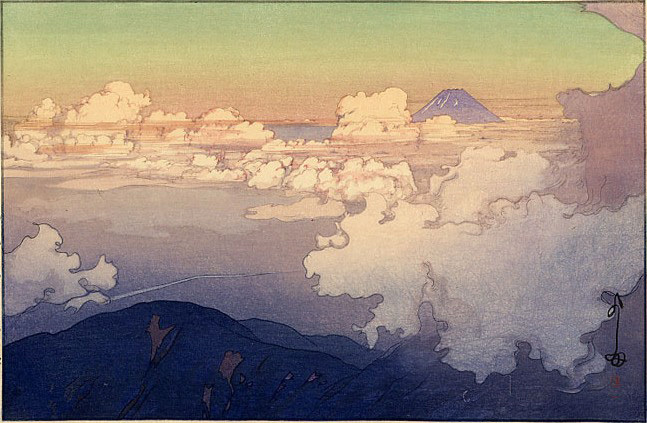 see here the same cloud, albeit different times of day, as offered by frances gearhart and hiroshi yoshida. many similarities. yoshida's work presents far more subtleties than does hokusai's, and gearhart's far more outlining and simplifying than courbet's. but who learned from whom? do they more accurately owe each other a debt as do artists working at the same time? i think they do. Very impresssive examples, research and conclusions Lily. Such a posting can only be made with an inquisitive mind, razor sharp memory, and years of training. And a huge database with excelent picture tagging system ofcourse. Very informative ! why thank you, gerrie! i of course must agree with your every point (again, april fools), but for the memory part. while i don't favor the phrase 'dull as an old razor,' i'd say my mind these days is more like a butter knife -- i still can get through the stick of butter, but on my way to the warm bisquit i might forget why i cut the butter. The question of who influenced whom is fascinating, indeed! Did Hasui and Riviere know of each other? If not, how come that there are such striking similarities in their prints - for example the way that they depict rocks or the sea. If yes, for chronological reasons the Frenchman must have lit the way for the Japanese. 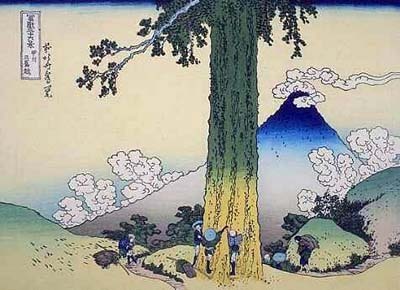 Or did they maybe coincidentally choose the same path , indicated to them by the work of predecessors like Hokusai and Hiroshige? Or did this happen inevitably, because their art to a certain extend was the logical consequence of what Hiroshige and Hokusai had done? Hard to say... in any case we stand in awe and wonder in front of these wonderful works of art that you show in your posting, and in front of nature itself. that stand slowly grinding at the sky's edge. thank you! and wonderful comment from you! who are you? somebody i know? i love rilke when he's ecstacic. thanks for that. and surely you meant yoshida, yes, aren't his and riviere's styles similar?! i have some other examples that are startling -- i'll work them in sometime. who influenced whom? well, yes, each, heck, all of them, were deeply influenced by the edo ukio-e masters. i think by the 20s they were all pretty much aware of each other's work. yoshida travelled world-wide, and while i don't believe riviere ever travelled to japan, he did study the specifically japanese techniques of printmaking in order to reproduce them himself. see here. also by the 20s i dare say everyone had so learned to see differently that they were being influenced by the japanese work, whether they knew it or not. I am glad you like the Rilke-poem. Unfortunately the translation is only a cheap copy of the magnificent German original (which rhymes), but you can't really translate poetry, of course. As a matter of fact, I really referred to Hasui, and not Yoshida: there are some Hasui woodcuts that very much resemble Riviere's seascapes. I have been following your blog for some time and I enjoy it thoroughly: a real source of inspiration! I have got to know so many artists that I hadn't known...Carl Oscar Borg is another one. klaus! i had no idea! i'm so glad you said something! what kind words you have, and, you know, i've found that with poetry, sometimes a "rough" translation can bring a reader closer to the soul of the poem than a "schooled" one. anyway -- sorry to have erroneously corrected you! my response was mainly because i had mentioned one and not the other. 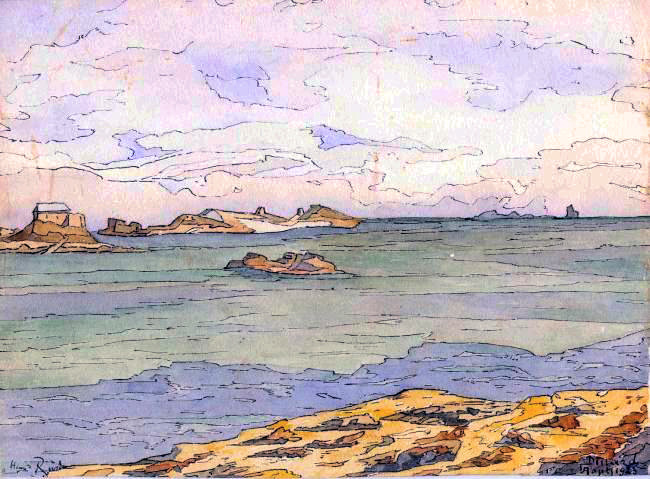 but the ironic thing is that i see endless correspondences between hiroshi yoshida and henri riviere and almost none between riviere and hasui! though i'll admit that i find many of hasui's pieces, i don't know, forced, or perhaps trite (? ), i'd love to see some examples of ones that have made that jump for you. As far as parallels between Hasui and Riviere are concerned, I see similarities between e.g. Hasui's "Seven Mile Beach" and "Morning at Takamatsu", and Riviere's "Brume en Mer" and "Le souleil Couchant" (although these works are also strongly reminiscient of Yoshidas prints from the "Inland-Sea"- series, I must admit); also between Hasui's "Muroto Peninsula" and Riviere's "La Tempete". in any case, parallels or not: all works of outstanding beauty. this is wonderful, klaus -- thank you. i'm rubbing my hands together in anticipation of the search! by the way, yoshida also made concessions to the western market. traveling around the world and holding shows frequently, he realized that the west was far more interested in his work than were the japanese. that was i think a main impetus to him taking the job of printing back from watanabe and doing everything himself. why share the profits? a number of his pieces that were at watanabe's place were destroyed in an earthquake & fire; do you know if hasui stayed with watanabe all along and lost pieces in the fire too? as far as I know, Hasui worked together with Watanabe all along until his death, except for a relatively small number of prints that were produced with other publishers (Doi, for example). And yes, the plates of his woodblocks from before 1924 were lost in the eartquake, too. These prints are very valuable today, of course. The best reference for Hasui prints is Hanga Gallery, there you also get a chronological overview of Hasui's work with images - but probably you know this. no--i wasn't conscious of that, so many thanks! what i find myself wondering, too, is whether hasui was able to out-produce yoshida by such a large margin because of his association with watanabe -- what do you think? I am not an expert, but I'm quite sure that this was the case. After all, Hasui was supported by a whole team of people in the process of producing his prints: he could concentrate on the design itself while others dealt with carving, printing, marketing. Yoshida was more of a one-man-band. However, quantity doesn't always correlate with quality, as we said before. i actually would say that of all of yoshida's prints (i have the book) the only ones which are not breathtaking masterpieces are the nudes and maybe the tropical fish. Well, Lily, I agree that three quarters of his works are outstanding. 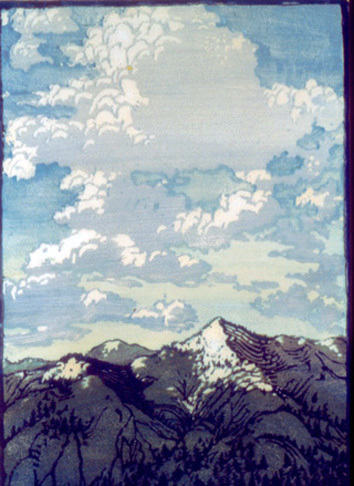 I love the contemplative mood of the "Inland Sea"-series ,the exotic lyricism of his oriental prints and the monumental kenness of his alpine motives. On the other hand, some of his gates and temples seem a little dull and interchangeable, both in line and in color. The first of his prints that I bought was "Small Town in Chugoku", and I remember the sense of anticipation in the days before it arrived. Well, once it was there, it did`'t take more than two minutes for me to decide to resell it: it didn't have soul, it didn't appeal to me. you do know that my home is filled with arthur dows, and elyse lords and margaret pattersons and many more, and i never bought a one. i stole all of them. Lily, I admire your criminal energy!!! those of us on a fixed income need ingenious ways to the finer things in life!